Due to various reasons such as location and structural features, basements are prone to flooding. Such a situation can prove to be quite an ordeal, particularly if the basement is finished. Once you discover excess water in your basement, the first move that you should make is to extract it as soon as you can. In situations where the water is not too much, a mop or a sponge will suffice. However, flooding does not always occur in small amounts. There are times when more than just average household items are needed. One of the reasons why basements are prone to flooding is because of its proximity to the water table. The risk also increases if the water table is high. When it rains, the ground can become inundated with water and if the home already has cracks in the foundation, water can enter your home. There are some people who have already identified this problem and installed sump pumps as a remedy. A sump pump is a piece of equipment that is specially designed to extract liquids from a low-lying place such as a basement. 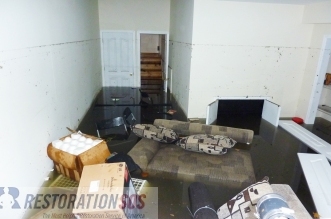 Another item that can be used to remove floodwater from the basement is a wet vacuum. Despite the plainness of its name, it is not to be confused with ordinary vacuum cleaners. Unlike its household counterpart, a wet vacuum is meant to be operated in wet environments. Thus, it can effectively draw out the water without risk of electrocution. Once you have discovered that your basement has experienced some flooding, your first reaction must be to remove the water. If the flooding is manageable, all that is needed is to mop the wet areas up with an absorbent item like a mop. However, if the flooding is major, it's time to bring out items of professional standard. Choosing the equipment you will use to dry a finished basement is not a matter of chance. The situation must be carefully assessed to know which kind is best suited for it. Take note that a sump pump will need an exit point in order to remove the water. Without it, the pump will not work properly. Remember that when a basement floods, that logically entails that the drainages are rendered useless. Most likely, you will need to attach a hose to the pump so you can lead the water out of your home. On the other hand, choosing to use a wet vacuum has its own consequences. The receptacle of this particular kind of vacuum is small, which means that you will have to empty it often. This can be quite bothersome for people and, thus, make wet vacuums as an inefficient choice. Either way, it is still important to note that whatever equipment is used, what is important is that the moisture is removed as quickly as possible. After the water has been taken out, dehumidifiers, heaters, and increased ventilation will also help.